Join the Collie CWA Evening Branch for an evening with Fanny Lumsden, multi-award wining country music singer, for her Under Our Hills Hoist show - full of stories and fun times from her travels across Australia. 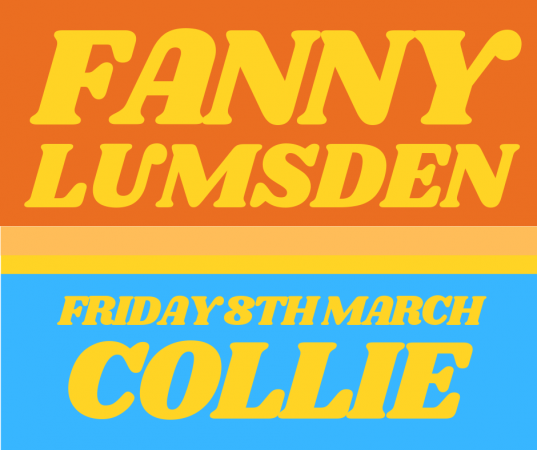 ARIA Nominated Fanny Lumsden presents an exclusive intimate performance at Collie CWA Hall. Having driven over 160,000km around this country playing shows, Fanny is bringing their Under Our Hills Hoist to Collie to share stories and good times! Five years on from the release of her debut EP, Fanny Lumsden is hitting new highs with her second album, 'Real Class Act' not only debuting #1 on the ARIA Country Album chart and #23 on the ARIA All-Genre chart. This was a mighty feat for the western NSW raised and regionally based artist being the only independent album to reach #1 for 2017. 'Real Class Act' was released on Fanny's own label, Red Dirt Road Records and has recently been nominated for Best Country Album at the 2018 ARIA AWARDS. The lead single 'Roll On' reached #1 on the Country Music Channel & KIX Country charts and has spent almost half a year in the Top 10 of The Music Network Country Airplay chart. The charts are another highlight in an already stellar few years for the Riverina based singer-songwriter who received both the Golden Guitar Award and CMC Award for Best New Talent in 2017, along with the APRA Professional Development Award (Country) and an ARIA nomination for Best Country Album for her debut album 'Small Town Big Shot'. Fanny has also added a further Golden Guitar to her collection, for video of the year in 2019. No stranger to the road the past 18 months have seen Fanny and her husband, band mate and business partner Dan Stanley Freeman traverse over 150,000km in their little caravan playing shows all over the country. Along with their world-class band The Thrillseekers, they have just wrapped the 7th Annual Country Halls Tour which they entirely produce and run themselves, which sold out halls throughout regional and remote Australia whilst raising funds for the halls as they went. Nominated for 3 CMC awards, 3 Golden Guitar Awards and the Independent Country Album of the year, its no wonder ‘I love Fanny’ are the words on everybody’s lips.